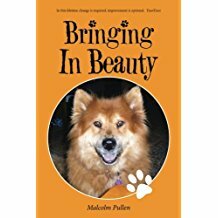 “Bringing in Beauty” lays out the the many challenges and lessons the author faced when he choose to accept what seemed a challenging but doable task, earn the trust of a fearful, illusive, stray dog and rescue it. The task became a six month journey of learning about the stray, about himself, about life. The reader will experience the challenges that fostered the forming of a deep, rich, and lasting bonds between he and the stray. Malcolm Pullen knew the dog needed to be in a loving home where it would receive loving care. It began with a simple agreement to visit the dog to see what might be done. The visit became a four to six week commitment to feed the dog and possibly continue if progress was made. It became a six month journey about life. Each challenge deepened the author’s resolve, each success solidified the growing bonds the pair were opening to. In time it became evident the journey was about both Beauty and the author opening to trust, opening to love, opening to beauty. In “Bringing in Beauty,” Pullen wholeheartedly narrates his and the stray’s story through the book’s pages. He reminds readers that even the simplest of journeys can shape trust which deepens and enriches shared bonds. Pullen lovingly writes about each challenge, each lesson, each time a bit more beauty opens between he and Beauty. In time Pullen realizes the journey is about opening to the grace of bringing beauty and Beauty into his life, into his home. Most of all, the author hopes that many readers will recognize how little choices can bring beauty into their lives if they allow themselves to notice. Catch “Bringing in Beauty” as it takes part in the upcoming 2018 Frankfurt International Book Fair. Happening on October 10-14, 2018, this book and thousands of other great titles will be of attendance during the world’s largest trade fair for books so be sure to check it out!